I don't remember where I saw this idea, but I did see it in a cookbook somewhere and I thought it was too cute to pass up. I am always looking for new ways to make breakfast healthier and more exciting. I found these cute little banana split dishes at Publix and thought they really just added another element of fun to this whole idea. This is also a versatile breakfast idea- you can change up the fruits and toppings with whatever you like best. and you still have time to enter my giveaway! This is such a fun idea! I've added it to my "breakfast ideas" folder. Thanks for sharing! Cute idea and it looks delicious! Definitely making this one! I love this idea! A great and fun healthy breakfast! love the idea!! soo perfect for break fast!! i shud try this soon.. my first visit here and m loving every bit of it! This is so cute and kid-friendly. Waking up to this would put a smile on anyone's face :)! What a fun idea. And I'm not against ice cream for breakfast either - haha. I absolutely love this idea. So cute and so good for you. I'll be trying these "banana splits" in my house. Ha! 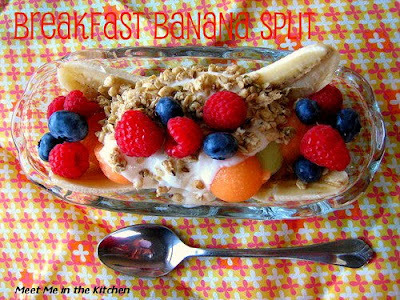 I think I have a decontructed breakfast banana split every morning. I LOVE this idea - how cute!! Looks like an amazing breakfast. Love things that are chock-full of fresh fruit. I always laugh when I notice myself in my food pics and didn't think I was in there. The spoon reflection is too cute!